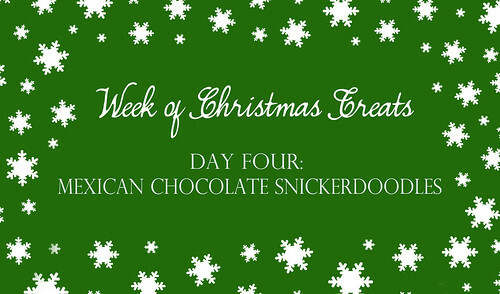 Week of Christmas Treats day four and, once again, I’m super excited about this recipe. Funny story, I actually got the recipe from a cookie magazine I bought at Home Depot, of all places. It was a total impulse buy and it wasn’t until I got in the parking lot and examined the receipt that I realized I had paid $10 for it! Yikes, a little steep for a magazine. Luckily it all turned out well because it was full of yummy recipes. There is a lot to love about this cookies. First the sweet and spicy cinnamon coating. As the cookie bakes, the sugar coating forms almost a crust. This crust gives the outside just the right crisp, while also sealing in the moist interior. The interior reminds me of a chewy and cakey brownie. If you use the optional cayenne pepper, it doesn’t really affect the flavor, it just adds a warmth. The flavor really reminded me of a Mexican hot chocolate I’ve had in the past. Mmmm…. One last note I need to make. When I wrote out my shopping list for cookie-baking I was sure, SURE, that I had cream of tartar. I could even picture in my mind where it was in the drawer. Fast-forward to cookie-baking time and cream of tartar is no where to be found in my kitchen. Of course I had already started and did not feel like running to the store. So I googled for substitutes and what I found is that there isn’t really one good substitute for it. The best I could find was vinegar, to replace the acidity. So that’s what I used. 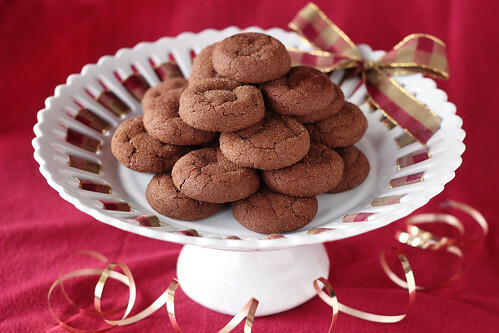 The cookie texture was perfect and we loved the flavor, so I plan to stick with the vinegar whenever I make these. But I’ll make a note in the recipe that cream of tartar can also be used. 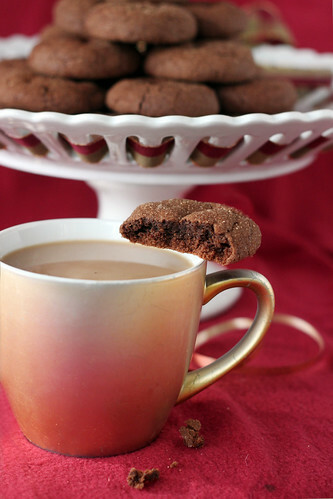 In a medium bowl, sift together the flour and cocoa powder. Set aside. In a large bowl, or standing mixer fitted with a paddle attachment, beat together the butter, sugar, brown sugar, vinegar (OR cream of tartar), baking soda, salt, and cayenne pepper, scraping down sides of bowl as necessary. Once well combined and light and fluffy, add the eggs and vanilla and beat until combined. Gradually add the flour and mix just until incorporated. Chill dough for 30 minutes. While the dough is chilling, stir together the sugar and cinnamon in a small bowl. Roll rounded tablespoons of dough into balls, then roll the dough ball in the cinnamon sugar. Place 2-inches apart on baking sheet. Bake for 10-12 minutes, or until the edges are set and the tops are cracked. Allow to cool on the cookie sheet for 1 minute, then transfer to a wire rack to cool completely. I love the combination of chocolate and chile (… and cinnamon). Is that mug from Starbucks :)?